Another photography post only one week after my first?? Let’s see if I can keep that trend going! Today we’re going to start talking about aperture, which to me, is one of the more confusing concepts to grasp. First we’ll start with the definition. Aperture - Measured in f-stops, aperture controls the size of the opening in your lens. The size of the opening controls the amount of light that passes through the lens, to the image sensor. 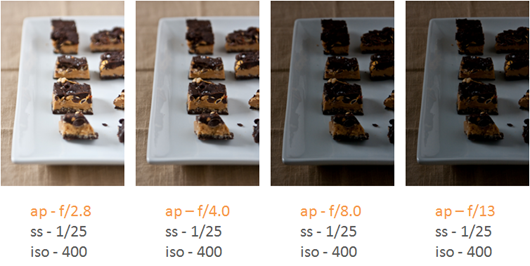 Aperture effects the exposure + depth of field in your photographs. Now, how about a few other definitions so that makes a little more sense? Kind of a snooze-fest to read definitions, but I promise knowing the list below will help with your understanding of aperture. Also, reading these out loud + slowly really helps. Maybe wait until you’re at home to do that though. ;) I’ve tried to strip down these definitions, to make them as simple as possible. I hope I don’t cause you a headache. f-stop – The measurement of how much light passes through a lens. This is controlled by you, and varies, depending on the number you set your f-stop to. Changing the f-stop number, changes the size of the opening in your lens, which varies the amount of light coming through, effecting exposure + depth of field. 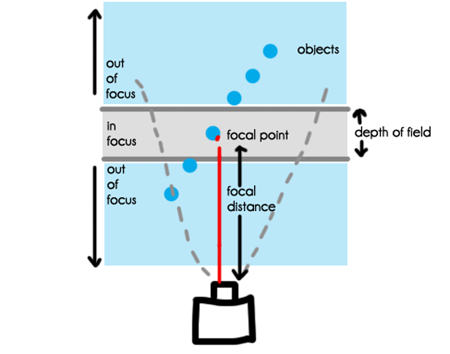 Focal Point – The point at which you have focused your camera. 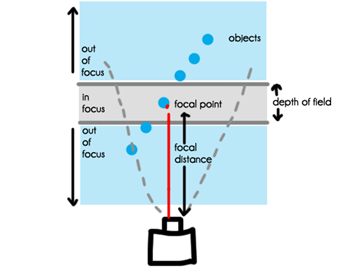 Focal Distance – Distance from the center of the lens to the focal point. Depth of Field [DOF] – An equal range of sharpness in front of and behind the subject. This is determined by aperture [f-stop #], focal length, and focus distance. Exposure – The brightness or darkness level of the photo, determined by how much light is coming into your camera. How about some diagrams to help explain things a little better? Hopefully this diagram speaks for itself, but there is a lot going on in it, so I’ll explain. When looking at this diagram, the above definitions should start to make more sense. The camera is focused on the small red dot [focal point]. Maybe a chocolate chip in that cookie? 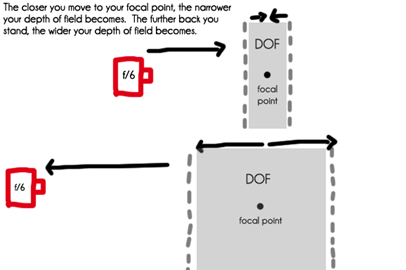 Your depth of field [what’s in focus] is determined by what you set your f-stop number to and how far you are from that chocolate chip [focal point]. How far away you are from the chocolate chip, is your focal distance. There is an equal amount in front of the focal point and behind it, that is is focus. The area outside of your depth of field, gradually becomes more + more out of focus. 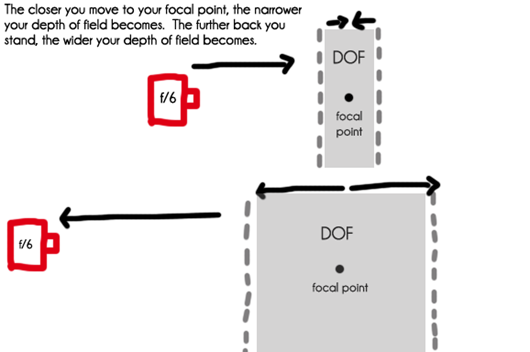 What determines your depth of field? Remember: Your DOF is how much of your photo will be in focus. 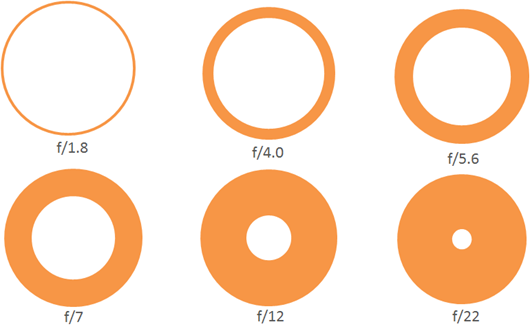 What you set your aperture [f-stop number] to. The focal distance [how far/close you are to that chocolate chip]. Now, another diagram!! Are you so super excited???? Don’t forget! Aperture not only determines your depth of field, but it also effects exposure [the brightness/darkness of your photograph]. Want something to compare this to? How about your eyes? Because, you might typically think, the wider the opening the more is in focus. But, it’s the exact opposite. So, if you want a wider depth of field [larger f-stop #, more in focus in your photo] you will need more light. Check out this photo example below, and hopefully it will start to make more sense. When you want more in focus in your photo [narrower aperture, wider depth of field, larger f-stop #], you will need more light to properly expose the photo. You can manipulate the amount of light coming in by adjusting the shutter speed and/or the ISO, which we will discuss in the coming weeks. Don’t forget! There is a give and take with aperture. While widening the aperture allows you to shoot in lower light, it also decreases the amount of the image that is in focus! Hey, at least I didn’t overwhelm you with all of this on a Monday!